In spite of its bright colors, this is an inconspicuous, forest-dwelling bird with soft, dense plumage, a stout bill, small, weak feet, and an upright, watchful posture. It is uncommon, living in lowland rain forest, and tall secondary growth (areas where the trees have regrown after forest clcarance). Perching in the middle or lower levels of forest vegetation, it sits quietly for long periods. The diet consists of fruit and insects. The bird watches for an insect from a perch, then swoops out, hovers momentarily with a flutter of wings, snatches the insect, and takes it back to the perch. The song is a series of "kyou" notes, accelerating and then stopping abruptly. There is also a low, purring call. 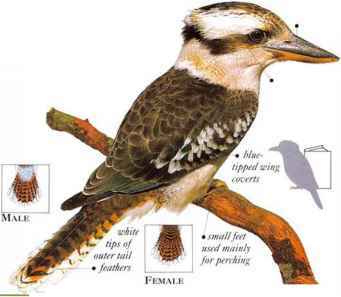 • NliST A cavity in a tree, or a woodpecker hole, or a hole excavated by the bird in rotten wood or a tree-termite nest. • DISTRIBUTION From Colombia and N.W. Brazil as far south as Peru, Bolivia, Paraguay, and N.E. Argentina. Sitting motionless for long periods on an open branch, this quiet bird is inconspicuous in the upper levels of forest. It is mainly a solitary bird, although pairs sometimes perch near each other. The diet consists of insects, particularly caterpillars. 1'he bird flies out to seize an insect from foliage or a twig while hovering, afterward returning to its perch. 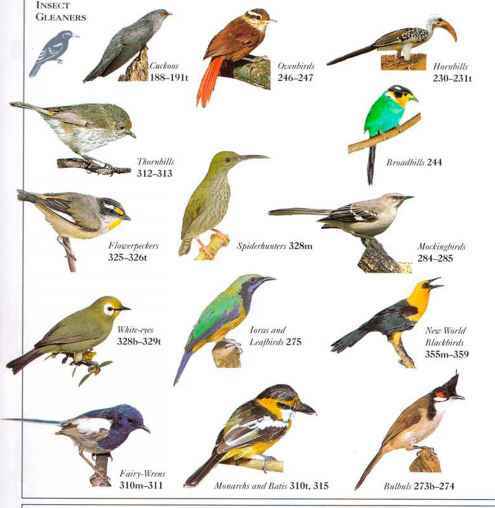 Insects are also sometimes chased and caught in midair, and at times the bird creeps along branches in search of prey. Usually the flight is direct and heavy, but the bird is capable of fast, twisting movements when chasing insects in (light. 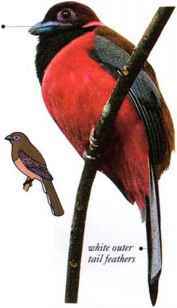 The Narina ^ Trogon sometimes joins the mixed-species (locks of birds that hunt insects through the forest. The male bird titters a soft, rapidly repeated, dovelike "coo," while flexing his tail up and down. • NF.ST An unlincd, natural cavity in a tree trunk, branch, or dead stump. • DISTRIBUTION Forested regions distribution of Africa south of the Sahara. 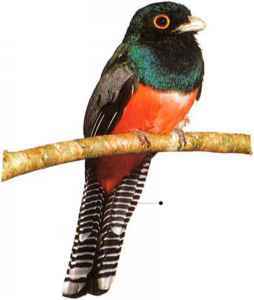 A quiet and inconspicuous bird, Diard's Trogon is widely distributed but nowhere common in the forested lowlands where it lives. It has the rounded wings and long tail with square-tipped feathers that are typical of the trogons but, as in other Asiatic species, its back is rufous-brown instead of green. Usually occurring in pairs, it perches on bare branches in the middle and lower levels of forest foliage. Here the bird sits upright and motionless for long periods, except for slight, watchful movements of the head. When pursuing small insects such as beetles and moths, it moves in rapid and agile flight among branches and vines. The prey is grabbed with a quick movement and a loud flutter of wings before the bird returns to the perch. 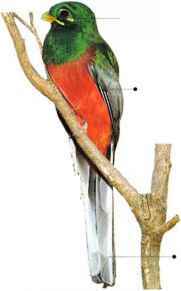 Diard's Trogon also snatches insects from leaves or twigs while it flies. • NEST An unlined hole in a rotten tree stump, excavated by the nesting pair. Sometimes the birds enlarge an existing hole. • Distribution s.e. Asia from Sumatra and the Malay distribution % Peninsula to Borneo. 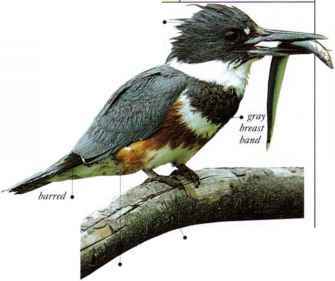 A big, shaggy-headed kingfisher with mainly blue-gray and white plumage, this is a conspicuous bird of rivers, ponds, and streams. It is seen in unsteady-looking flight along streams, or pausing to sit on a prominent pcrch. From here it watches the water below and when a fish or other moving creature is sighted, the t>ird plunge-dives to seize it. often first hovering briefly. Fish are carried to the perch, slapped against it, then swallowed head first. 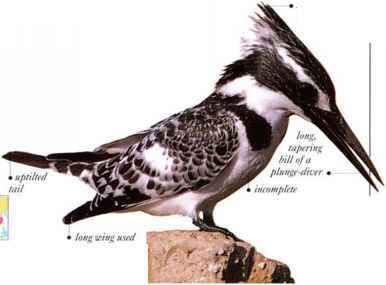 • NEST An upward-slanting burrow in a bank beside water, up to 16'/; ft (5 m) long. • DISTRIBUTION Breeds in North America. Winters as far south as N. South America.